Back in East Liberty's first heyday, when international cuisine meant either Italian or Chinese, Tana's sweet little terracotta storefront housed Charlie Ung's Tea House. We didn't arrive on the scene in time to patronize it, but in hindsight, Charlie Ung's seemed to capture the flavor of the era in which it flourished. Similarly, the restaurant's transformation to Tana Ethiopian Cuisine seems to typify the spicier, more globally savvy East Liberty of the turn of the 21st century. 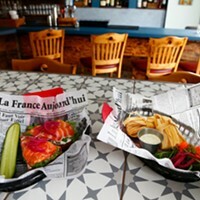 With its large floor space, Tana aspires to offer more than modest accommodations for an ethnic meal. Sure, its walls display the requisite travel posters and artisan bazaar purchases from back home. (The proprietor, Seifu Haileyesus, is an Ethiopian immigrant; his older sister helps out in the kitchen.) But with a spotlit bar adjacent to high cocktail tables in the center, small tables clustered in the front window for people-watching, and a spacious dining room behind them, the feel is more upscale than hastily arranged. With live jazz on Wednesdays and monthly African events, Tana also makes efforts to create a sense of community. The cuisine itself is made for sharing. Tana serves meals in the traditional Ethiopian style: A single, large flatbread (injera) is topped with various meat and vegetable stews, and everyone at the table helps him or herself using their fingers (forks are by request only). For those feeling more individualistic, meals are also available on smaller, personal-pan-sized rounds of injera. But we were more than happy to have the various components of our order piled on a communal platter that approached 2 feet in diameter. 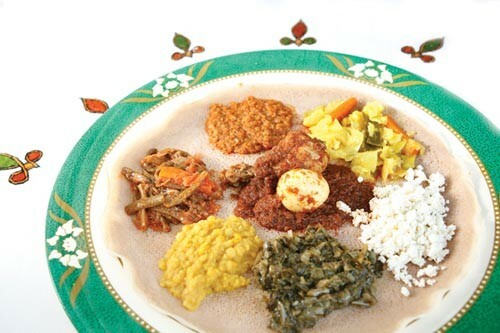 Except for the soups and a select couple of the appetizers, everything on the menu is intended to be served on injera. Veggie dishes can be ordered as entrees, but also come in smaller portions, as sides to entrees featuring beef, chicken or lamb. 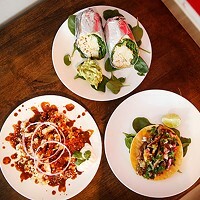 Since diners are entitled to select two sides with each entrée, this makes it easy to taste a broad range of Tana's offerings; just three diners working together can sample nearly half the menu. Ethiopian cuisine has a reputation for spiciness, but Tana offers a generally mild range, perhaps out of deference to American palates. Spice is available if you want it, however. We were brought a complimentary plate of cornbread, dry on its own and lacking in American-style sweetness, but meant to be dipped in an accompanying bowl of berbere sauce. This lent the bread both moisture and a glorious heat -- not punishing, but unmistakable, and with a sophisticated blend of peppercorns, chili peppers, garlic, ginger and more. Those who dare can confidently request more spice from the kitchen. We ordered two salads, one which came on its own, and another which came, with our entrees, on the injera. The former featured sweet plum-colored beets and earthy chunks of potato. It was nicely dressed, with subtle garlic and lime notes brightening the substantial, starchy root vegetables. The latter -- a simple summer salad of fresh tomatoes chopped with onions and tossed with herbs, oil and vinegar -- provided a cool contrast to the heartier hot dishes. The injera, of course, soaked up the dressing, as it did the sauces of the various other dishes; this is part of its genius. While pasta and rice become coated with sauce, injera literally absorbs it like a sponge, so that one of the pleasures of an Ethiopian meal is picking up injera from one part of the platter and using it to envelop a different food. Because of the multiplicity of dishes served on one injera, many combinations are possible: We particularly recommend the tomato salad with powdered roasted chickpeas (shiro wot) and the collards with chicken (door tibs). Indeed, the door tibs was the most outstanding of the four meat entrees we tried: Its fine shreds of chicken were indistinguishable from their thick sauce of herbs and mild awaze chili sauce, so each bite was packed with flavor. Tana tibs -- lamb sautéed and simmered with onions, peppers, garlic, rosemary and more awaze sauce -- was also excellent: tender, savory and deeply seasoned without invoking fiery spice. Yesga wot -- beef, cut into small pieces and stewed in turmeric sauce -- was similarly tender and mild, yet robustly flavored with a complex blend of herbs and spices. Some claim that Ethiopia enjoys 13 months of sunshine. If that's true, a meal at Tana -- full of bright flavors and made to be shared with friends -- may be an antidote to the long, lonely Pittsburgh winter to come.